This quaint view of the pueblo of Los Angeles—drawn just seven years after the city was incorporated and California attained statehood—is perhaps the earliest booster map created for the area. Swiss immigrant Charles Conrad Kuchel and German immigrant Emil Dresel traveled around the new state making such maps as part of a series called “California Views.” They first took daguerreotypes from an elevated vantage point, then drew a bird’s-eye view of the settlement, capturing the quality of life and examples of early regional architecture. 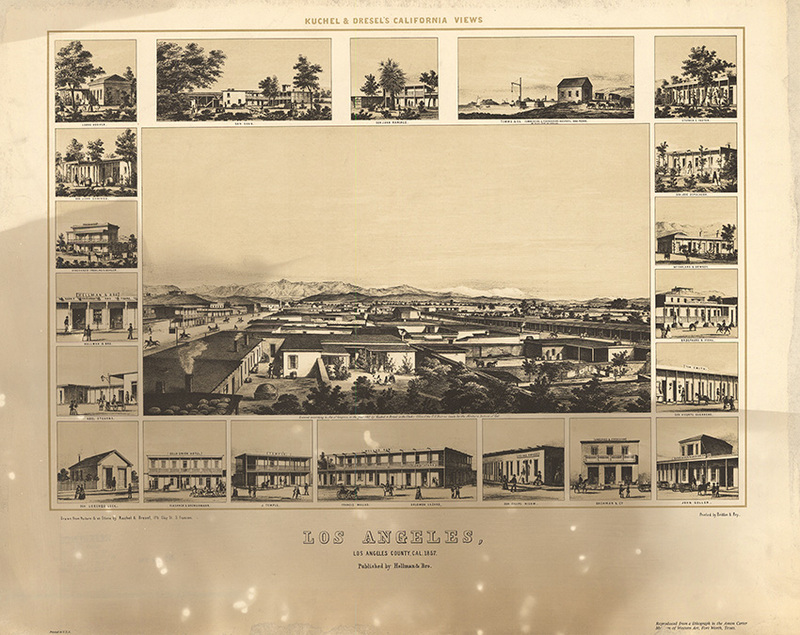 While the largely lawless Los Angeles was certainly not as idyllic as depicted here, the layout is accurate, and the city’s early adobe structures can be seen along the wide thoroughfare that is Main Street. Most of the buildings were sturdy one-story structures, but the Bella Union Hotel (on the left side of the center image) boasted two stories at the time of this drawing and would gain a third by 1869. Bella Union was the social center of the city; it was built in 1835 to house Isaac Williams, a merchant from New England. Later, Mexican governor Pio Pico made it his capitol building but was forced to vacate after American forces laid siege to the residence during the Mexican-American War. Pico managed to recapture the building, and he sold it back to Williams who in turn sold it to Don Benito Wilson who converted it to a hotel in 1849. 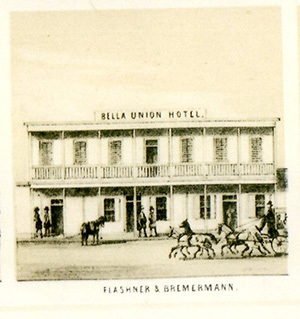 The Bella Union was the first hotel in the city, but that didn’t mean it had much in the way of amenities. There was a horse corral out back, a canvas roof, and six by nine-foot rooms with dirt floors that turned to mud in rainy weather. That didn’t stop the Bella Union from housing L.A.’s first courthouse (the Court of Sessions met there from 1850 to 1852), the publishing house of the Los Angeles Star newspaper, and a rough and rowdy saloon that was often the scene of bloody gunfights. Business was booming, and the second story was added in 1851. When the Butterfield Stagecoach came along, they established an office in the building and brought mail service to far-flung Los Angeles. Wells Fargo also set up an office at the hotel, and when Phineas Banning began stage service to harbor in San Pedro, he too made Bella Union his headquarters. By the 1860s the hotel was a gathering place for the many Confederate sympathizers in Los Angeles who whispered disparaging remarks about President Abe Lincoln but never fired a shot—except at each other in the saloon. In 1870 the posh new Pico House opened less than a mile away with such luxuries as indoor plumbing and gas lighting. To compete, the rather ragged Bella Union was forced to knock out the adobe and remodel. In 1871 it became the Clarendon and then in 1875 the St. Charles Hotel, but old-timers continued to call the place the Bella Union. On November 30, 1876, the hotel hosted a Thanksgiving dinner to remember; chef Charles Salari prepared the bird and all the fixings, including fresh cranberries—no doubt locally sourced.